Tennessee Williams, who is generally regarded as one of America’s greatest playwrights, spent a good deal of his formative years in St. Louis. According to the biographical note in the program for the latest Upstream Theater production, Williams did not enjoy those years. Regardless of his fondness for the city or lack thereof, he was able to use those difficult years as inspiration for several of his plays, including the masterpiece The Glass Menagerie, in which Williams explores issues of regret, disappointment, and unrealized dreams. It’s a melancholy character study with a vivid setting in the city Williams remembered well, if not too fondly. At Upstream, Williams’ celebrated classic is brought to life with heartbreaking clarity, thanks to excellent production values and some truly great performances. The semi-autobiographical play is told in flashback. Inspired by Williams’ own life and family, The Glass Menagerie centers around the memories of the elderly Tom Wingfield (J. Samuel Davis), who looks back on his young adult years living with his mother, Amanda (Linda Kennedy) and sister Laura (Sydney Frasure) in a tiny apartment in St. Louis. As Tom steps back into the action of his own memory, the story reveals a family characterized by lost hope and denial. Amanda is a well-meaning woman who lives in the past, with unrealistic hopes for her shy daughter, who spends most of her time collecting glass figurines and looking through her high school yearbook. Tom just wants to get out of St. Louis and his stifling job at a factory so he can join the merchant marines and see the world. He indulges his mother’s request to find a “gentleman caller” for Laura by inviting an old high school friend (Jason Contini), who works at the factory and on whom Laura had once had a crush, over for dinner. This play has been staged many times over the years, on Broadway, regionally and around the world. It’s a piece that’s been read in high school and college classes. It’s one of those plays that can easily be seen with a sense of “oh that’s a Great Play” and somewhat of detached air. There’s no detachment with Upstream’s production, however. It’s fresh and vibrant, and very St. Louis. The sights and sounds are authentic enough to believe this world, which also has a slight imaginary twist since it’s being narrated as a memory. The extreme attention to detail in the production values and the superb casting are what bring this production to life. Speaking of casting, this production boasts three of the more celebrated performers in St. Louis theatre as well as a relative newcomer who is remarkably talented. These characters are living, breathing, thinking and feeling people, fully realized in these outstanding portrayals. Kennedy’s Amanda is well-meaning, but lives in a state of denial that is heightened in this production. Davis does an excellent job of portraying Tom at different ages, from the older, regretful man looking back, to the younger, disillusioned dreamer yearning for escape. Frasure is heartbreakingly authentic as Laura, portraying all her social awkwardness as well as her twin senses of regret for the past and a renewed hope that’s encouraged by her mother and aided–at least for a time–by the visit from Contini’s charmingly awkward, sweet but also regretful Jim. In fact, it’s the scenes between Laura and Jim that are the highlight of this show. Their chemistry is 100% believable, and it’s achingly affecting. The production values here are also first-rate, with painstaking attention to detail from scenic designer Michael Heil’s authentic-looking St. Louis apartment, to the meticulously appropriate costumes by Laura Hanson, to Claudia Horn’s excellent props. The period detail is seen in everything from the furniture to the antique phonograph, to Laura’s vintage wicker wheelchair. There’s also excellent atmospheric lighting by Steve Carmichael, and director Philip Boehm’s intelligent staging that emphasizes the closed-in feeling of the small apartment which amplifies the sense of a constricting society and social roles that the characters may feel forced to keep up. The Glass Menagerie at Upstream is a memorable realization of a classic, performed in conjunction with the new Tennessee Williams Festival. It’s set in St. Louis’s past, but with its excellent cast and staging, the drama is very much of the moment. This is a truly transcendent, remarkable production. Upstream Theater’s production of The Glass Menagerie is being presented at the Kranzberg Arts Center until May 15, 2016. 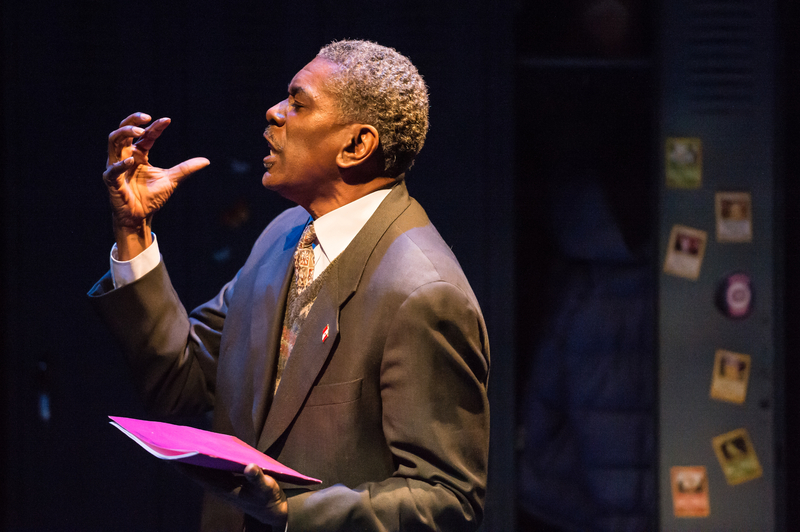 The latest production from Upstream Theater, Bashir Lazhar is a (mostly) one-man show and an intensely personal play. It covers so many issues in such a relatively short time, with a compelling blend of emotion and simplicity. At its heart, though, is a brilliant performance by a remarkable St. Louis actor. When we first meet Bashir Lazhar (J. Samuel Davis), he’s practicing introductions for his job as a substitute teacher in a Montreal school. He’s new to this school and this country, and he’s nervous and eager to make a good impression. Through the course of the play’s non-linear presentation, we alternate between scenes of Lazhar getting acclimated to teaching his class, and scenes from earlier in his life. We learn about his past in Algeria, and why he fled to Canada as a refugee, as well as how he came to accept the substiute teaching position, and eventually, why that job was vacant in the first place. We get to see Lazhar the man as well as Lazhar the teacher, whose life experiences profoundly influence his highly personal teaching style. Eventually, we see conflict build both in his job and in his living situation, and he struggles to maintain both his vocation and his residency in Canada. Without giving too much away, I can say it’s a story that’s at turns heartwarming and heartbreaking. The key element of this finely scripted and expertly directed production is the amiable and affecting performance of Davis as Lazhar. It’s a rich, multi-layered performance that conveys both warmth and depth. We see the eager to please Lazhar pouring himself into his job, and his devotion to his students as well as (in the flashback scenes) his family in Algeria. Davis has the energy, presence and charisma, as well as the emotional depth to bring this role to life in a profoundly compelling way. He takes us on Lazhar’s journey with him, and there’s not a dull moment or a false note in this superb performance. Aliya Taliaferro is also excellent in a small role as a schoolgirl who appears in one scene (a role that will also be played by Eden Harris and Avery Smith in subsequent weeks’s performances). Technically, the play is simply presented but extremely effective. Cristie Johnson’s set is appropriately evocative of a classroom and hallway in the school, and there’s a striking use of lighting, designed by Steve Carmichael. All of the technical elements–including Claudia Horn’s props and Michele Friedman Siler’s costumes–work together to achieve the proper atmosphere for both the school setting and support Davis’s excellent work as Lazhar. This play is intensely moving, managing to be at turns funny, hopeful, and intensely sad at different moments in the production. The ultimate result is a play that’s sure to stir both the thoughts and the emotions of its audience. It’s an educational play in the best sense of the word, illuminating the issue of the plight of refugees as well as providing insights into the nature of education and what makes a good teacher. All of these elements are more than ably conveyed in the truly excellent performance of J. Samuel Davis. This is a tour de force not to be missed. “What would you be willing to die for? What would you be willing to kill for?” These questions are asked on the program cover for Upstream Theater’s new production of the classic Greek tragedy Antigone. 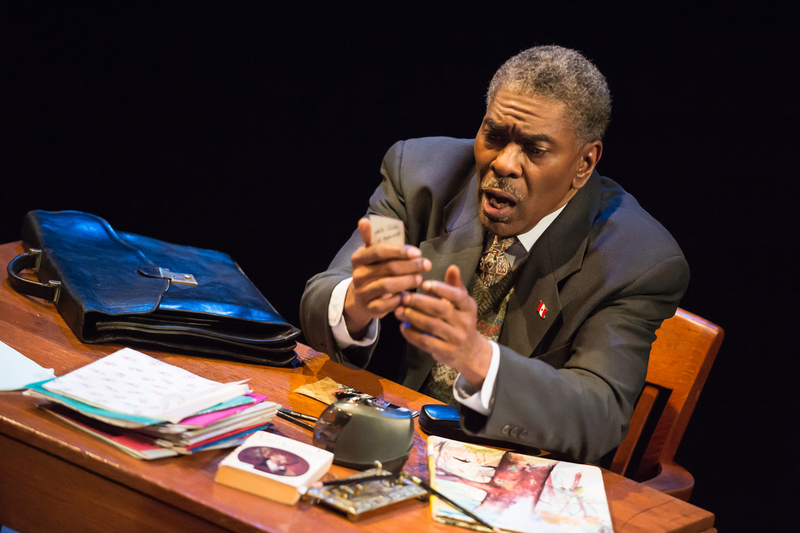 These questions have been asked in many varied ways throughout the generations, and Upstream brings them to the stage with its simply staged, powerfully acted presentation that strikes a relevant chord in today’s world, and particularly in St. Louis. Civil disobedience is at the forefront of this story, but it’s not the only issue dealt with. In fact, Antigone herself (Maggie Conroy) isn’t the main focus of the play. While the story begins with Antigone, the action centers mostly on Creon (Peter Mayer), the king of Thebes who issues a controversial order and has to deal with its consequences on himself and his family. In the wake of a recent war, Creon decides to give an honorable burial to one of his nephews who defended the city, while allowing the other nephew–who fought for the other side–to be left to the elements as food for vultures. It’s never a serious question for Creon’s niece, Antigone, that she will defy her uncle’s order and bury her brother, even though the penalty for doing so is death. She is resolute, even when her devoted sister Ismene (Wendy Renee Greenwood) refuses to join her in her efforts. The real dilemma presented is for Creon, who is confronted with his own power-consciousness and must make a decision between revenge and mercy, pitting him against public opinion and his own son Haemon (Andrew Michael Neiman), who is engaged to Antigone. As Creon is forced to deal with tragic consequences of his own ruthlessness, the ever-present Greek chorus (Dennis Lebby, Norman McGowan, and Patrick Siler) is there to both react and comment on the situation. This is one of those plays that a lot of people read in high school but then mostly forget. I have to admit I was surprised at how little Antigone herself is in the story. The play’s named after her, but she is more the catalyst for the action than the protagonist. In fact, the earlier scenes between Conroy as Antigone and Mayer as Creon have an almost clinical sensibility to them. I was expecting more emotion, but that doesn’t come until later in this production. Conroy is excellent as the matter-of-fact Antigone. She’s not histrionic or conflicted. She knows exactly what she’s going to do, and she communicates that well. Mayer, for his part, portrays Creon with a detached coldness at first, which makes his descent into near-madness in the second act all the more affecting. 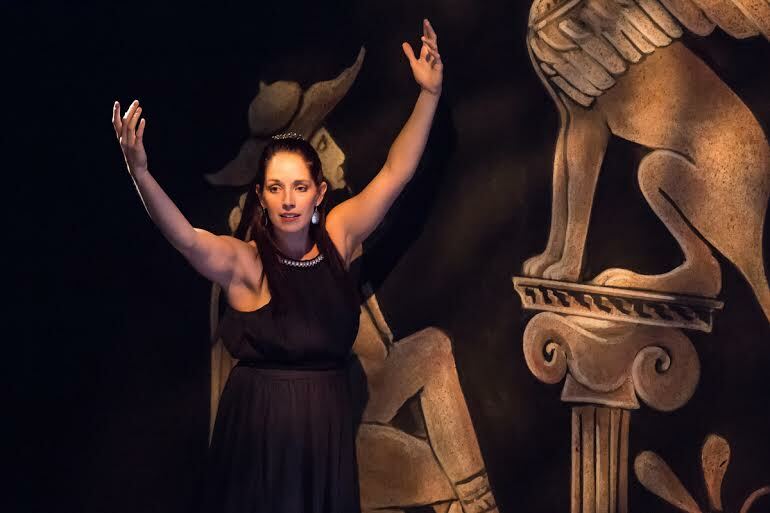 There are also good performances from Greenwood in a dual role as Ismene and as Creon’s wife Eurydice, and Neiman as the conflicted Haemon. Lebby, McGowan and Siler bring character and gravity to their roles as the chorus members, who are wary and sometimes fearful of Creon, and John Bratkowski is memorable in two roles–as Creon’s guard and as the blind soothsayer Teresias. Nancy Lewis makes the most of a small role as a messenger, bringing much weight and empathy to her characterization. The overall tone of this production is simple and timeless, giving an appropriately mythical quality to the production while highlighting its immediacy. The set, designed by Michael Heil, is minimal, emphasizing giant Greek-style paintings by James Van Well that line the back wall. 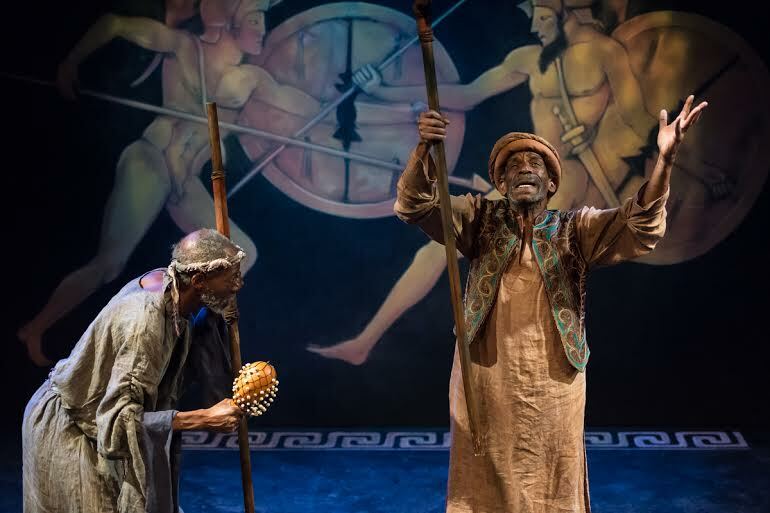 The costumes, by LaLonnie Lehman, are ancient Greek influenced but also surprisingly modern, especially in Creon’s outfit, which is simple but more contemporary. The lighting, designed by Steve Carmichael, is strikingly effective, particularly in the near pitch-dark blackouts between scenes, which highlight the increasing bleakness of the situations. For a show that’s set in the misty past, this Antigone is striking a modern chord, even with the overall timelessness of the its atmosphere. Especially in St. Louis, where the issues of abuse of authority and reactions of civil disobedience are making news daily, this is a surprisingly relevant play. Upstream’s excellent cast and crew have brought us this play with simplicity and profound clarity. It’s a play from yesterday, but very much for today.